Anyone tried video streaming on the unlimited plan? expression: Anyone tried video streaming on the unlimited plan? Yep... I've tried iSky, YouBube(not really streaming though), NASA TV Realtime Streaming, and some UK based radio streams all seem to have no issues although the UK one randomly disconnects after 1 - 2 hours. So overall people find this plan ok? I just mainly need it for streaming youtube / hulu / Netflix and facebook/email etc. while my brother needs it for xbox live gaming, mainly call of duty, that new one which I dont know the title of. I also do a lot of skype calls during the nights to my mate down the road when we're bored, would this plan suit my needs in terms of speeds? We're currently on the 60GB plan with telecom and we're reaching that limit each month, when we have school, and since I've just finished high school and I dont start uni until end of Feb, its going to be tough if we try stretch 60GB with two teens at home all day. Just wondering if you should have a sig with a statement that you work for slingshot and not the average consumer. I'm finding this plan perfect. My net has always been full speed for http/ftp/p2p, two weeks in and no problems. I do get disconnected for a couple secs each day at around 10pm ish, but thats not bad. It is called all you can eat, so I suppose my 30gb daily average isn't a problem with them. I can also confirm that I am having no issues with Slingshot on this new plan. I max out with Bittorrent/threaded HTTP and streaming all but 1080p video is fine, I have to wait a few seconds for 1080p to buffer first. I have noticed some gentle throttling over early evening hours (torrents which max my line at 1.6MB/s slow to a few hundred kB/s) but other than that I am perfectly happy. Another weird thing, my mate seems to be experience ftp and p2p throttling quite often, even during the night, but for some reason I haven't had any of this at all?? Can we please hear from someone who has made the move and is unhappy for whatever reason? Personally, I'd love to hear here about people that are HAPPY with the plan, but hey, thats just me.. 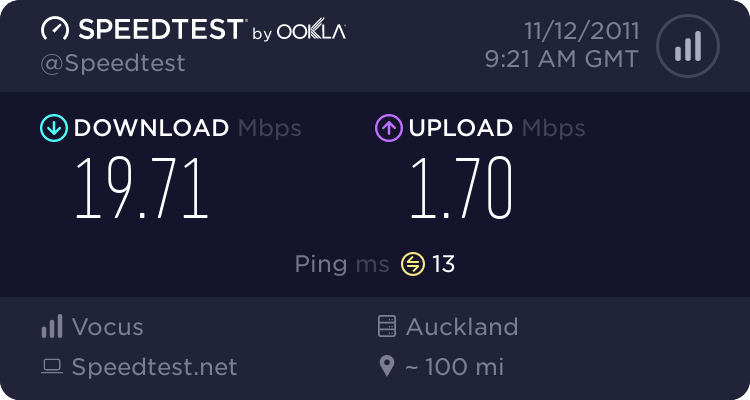 It works great for me till about midnight and then starts to slow down, but things still work whereas on the old plan in the free offpeak it would just have connections spoofed closed constantly, so big improvement on that. Yes we are just an average customer with the same constraints as everyone else, the only difference is staff credit. The only other difference is I understand what to expect I don't demand the impossible. I do see how you come to this conclusion however your guessing is incorrect. unlocker: Can we please hear from someone who has made the move and is unhappy for whatever reason? IT ISN'T POSSIBLE THAT SLINGSHOT HAVE HAPPY CUSTOMERS! THE UNIVERSE IS INVERTING! If anyone is unhappy I would like to hear from you as well. Any Issues can be PM'ed to me if you wish I can help. I would like to move to Slingshot but not having much luck by calling them, was transferred the first time and call got disconnected and second time hold time was so long that I disconnected it. Should I try signing up from the website?